I’m only somewhat dissapointed ;). The tint and Vf are certainly a big deal. The brightness not so much. I will try to think of a new mount with the ledboard closer to where the heat is removed, but I’m thinking of a new integrating sphere also so that will be a combined design and not likely to happen in the near future, if only because I’m rather low on cash and like to spend what I have on other things too. Crumbled white flat 2mm seems overheated or cooked for long time and while it was in that ultra hot state of matter some kind of pressure with some metal thingy was applied… Also specks of dirt everywhere(too much flux or solder paste) in fact if any of you guys got burning crater inside emitter(especially dedomed one) I would say that in 80% of case it means that hot speck of dirt got sucked into phosphor. It is nice to see under skin of such emitter. I like that. G2 looks like hot de dome failure since pressure was applied on wire which eventually broke. This one looks good. It has L4P DTP and your testing rig seems better than any flashlight diy test(luxmeter ++ clampmeter) so I don’t see any possible failure reason. Hmmm… Why should anyone be disappointed with new White Flat 2mm ? -Probably no need for spring bypasses either? So what is bad in that? Ok… I know what is bad in that. It is not suitable for mine single cell FET drivers(if they could be called drivers). To bad for me. LOL, in this case what you see is not what you get, both leds work perfectly fine. That XP-G2 is not broke, in fact it happily did 235 kcd in my mini-GT. 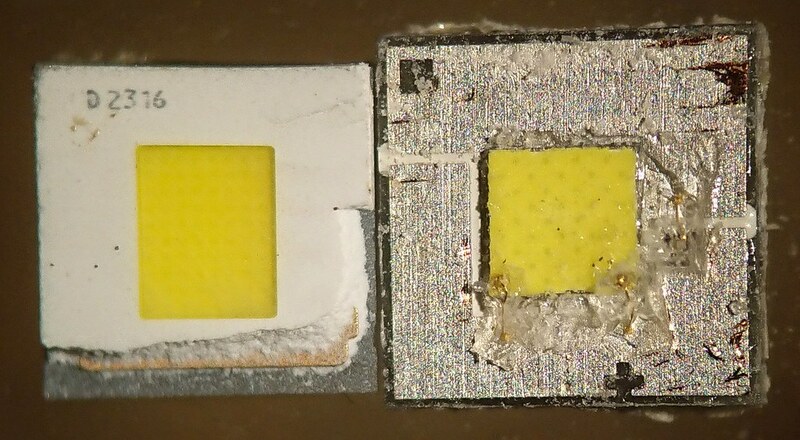 And the mini-GT is to blame for both leds, its centering ring is so tight in the reflector that the twisting action of the bezel when opening/closing it already sheared off two leds and cracked that PM1 led. OK that also sounds logical Except that decisive pic of g2 with broken wire which in fact is not broken. In that case LED is underdriven (maybe 4-5Amps), so kcd numbers similar to XPG2 S4 make sense, but in that case it’s strange to hear from you ““no throw gains over the dedomed XP-G2 S4 2B”, when you know you didn’t drive this LEDs close to its maximum (unlike XPG2 S4). 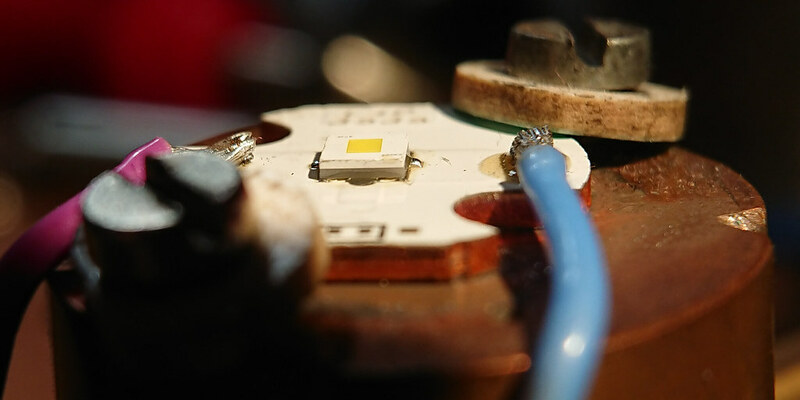 I think with tail on it is still closer to 6A than 4-5 amps, but in any case I did not make a general claim about this led but it was about what it did with my mini-GT compared to the led that was in there before, in the way that I built it. Still, I’m curious what other people find about the PM1. Ok, I went ‘back’ to a dedomed XP-G2 S4 3D (as claimed by intl-outdoor) and applied all the bypasses again and what is extremely annoying is that the driver still shows the problem of not lighting the led up at the low side of the ramp. So this is not a problem caused by the PM1 (at least it is not gone when swapping the PM1 again). I will have to beg Neal for a new driver again (the mini-GT has not been a succes for me thusfar). The tint is now yellowish but pretty ok (no green although well above the BBL, duv +0.012, 4100K) and I measure 225 kcd. Sounds like the 7135 died. If the switch-led report is correct, the led still failed to light up while the ramp was well into the section that the FET was used (2 blinks after halting the ramp up). In that case there’s more to it than a dying 7135. Those 7135 chips can handle some low voltage btw, I have made an infrared sk68 once (working voltage around 1.8V) with a 8×7135 driver that functioned fine with the 8 chips all burning off close to 2 Volts (I did take care of a good heat path for the chips). djozz, I just noticed something about your test. You tested the XP-G2 S4 2B with dome on. 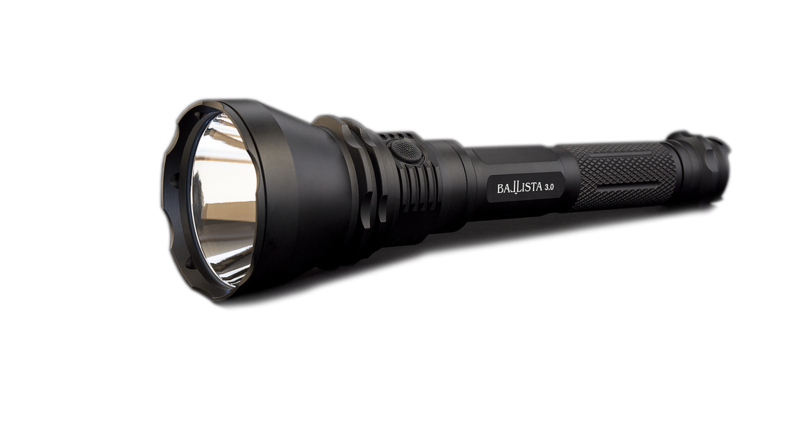 De-Domed it only goes to 1100lm according to koef3’s test. You numbers of the new Osram are very close to his of the Q8WP, both LEDs are much better than the XP-G2 de-domed. 6.5A seems to be about the sweet spot for the KW CSLPM1-TG (white2 as vinh calls it). I wouldn’t go above that when driving it with a buck driver inside a light that heats up. I did comment under the graph that the XP-G2 S4 2B test was tested with dome on, and also included that the PM1 clearly outperforms the dedomed version that puts out 10% less. Am I the only one person here that have dizziness of all that numbers and names like clsmngt1tuturbo etc. ? It is confusing, Osram doesn’t have good names for them. We basically have a 1mm^2 white flat, 2mm^2 white flat, and the boost HX which is just a bigger version of the 2mm^2 white flat. I really don’t know how I am getting 400 plus kcd in Brinyte B158? Magic? Bad lux meter which usually under reads dedomed XP-G2 S4 2B with greenish tint (confirmed by you) is possible reason since white flat 1mm is more blueish? It is confusing, Osram doesn’t have good names for them. We basically have a 1mm^2 white flat, 2mm^2 white flat, and the boost HX which is just a bigger version of the 2mm^2 white flat. Boost HX I like that name because it relaxes my brain. Very confusing, but liked KW CSLPM1.TG – 2mm2 a lot in C8+. Is there any reasonable 60-70mm reflector or aspheric still in production that isn’t like $125+? So I put a 2mm² version in my Amutorch JM70. After (CSLPM1.TG) : 555kCD ?! Same distance, same phone, same all except for the LED… awesome ! EDIT : My B158B now rocks an 1mm² one too, and a 2,8A Biscotti driver : 345kCd ! So I put a 2mm² version in my Amutorch JM70. I don’t trust my intensity numbers, but at 5m my “ceilingbounce” app says : Before (XP-L HI) : 270kCd After (CSLPM1.TG) : 555kCD ?! Seem that you managed to pump it up 105,56 % footballfields. This is with calibrated luxmeter. can i help you with something for buy ? Makes me want to buy more 1mm2 white flat. For me B158 goes 430kcd with 5.5 5.8A current draw and when it falls somewhere at 3A(fet driver) it is equalized in performance with de domed G2 s4 2b(driven at 4.7A I have 330kcd in B158 with g2). Not finished yet. So just reporting some info for those wanting to swap this emitter into a MF04. Used a thin solder layer as recommended and lapped the stock MCPCB and the emitter shelf. Used an old MT07 buck driver set to 4 amps. Using the stock MF04 reflector isolation ring the beam is not quite focused. At the moment, the emitter is not quite centered (but appears close) and it is visible in the beam. The hot spot is not sharply defined. I only measured 1.3kcd at 10.85 meters. I can’t find my favorite light meter to verify this reading. The light is way too big for my integrating tube. So no lumen measurements to report. No indications of thermal sage noted. Not sure what direction I need to move the emitter yet. I think it’s too high in to the reflector. The heat sinking with the large MCPCB and host makes me think I can probably up the current to 4.75-5 amps. Any suggestions on that from you folks using this emitter in bigger lights yet? I’ll report on progress when I get another chance to work on the light. If anyone has converted and MF04, please report what worked or didn’t work for you. For bigger host like SR95S UT of mine that measures to have Vf of 3.28v(I didn’t measure current but should be around 4.5A according to djozz’s graph), BLF GT heat up faster than my mod when I hold them left and right high on my shoulders for ten minutes or so. I think it should be fine for big host to up the current to 5A. Dang, this thread is long and confusing, unfortunately I don’t have the time to read all posts. I just found the collected voltage vs current and output diagrams in the first post and thought this LEDs could be usable for a 3D printed “kids save” thrower with 3x Eneloop and couple of 7135, perhaps in combination with a 60.0mm Ultra Narrow Catadioptric (10158). Is this a good idea? There are at least 2 similar LEDs mentioned here, which one would be the best choice? ^ yes this is a good led for a low current/power thrower. But we already had the (dedomed) XP-E2 for that, not many modders have used that led but I have build quite a few nice small throwers with it over the years. This KW CSLNM1-TG is much more capable though, with its low voltage even with small batteries it reaches its maximum power. If you want larger emitter his larger brother white flat 2mm may be even better for same configuration. I will change thread name and put both in first post so it will not be so confusing…. But it needs more current, I guess? I’m thinking of a light with a separate LED for flood and perhaps another one for RGB output. I still have two XM-L RGBW LEDs lying around and a couple of spare S2+ reflectors. 3D printing added a lot of options. I edited thread name and I added White Flat 1mm& White Flat 2mm aka OSRAM KW CSLNM1.TG (1mm2) & Osram KW CSLPM1.TG (2mm2) in first post of this thread. Both Djozz tests are in first post of thread. So you got 110kcd at 4A in a C8 with the 2mm white flat. That doesn’t sound that good since 4.5A with a dedomed XPG2 will get around 170kcd. I just did some measurements using a bench power supply on a 2mm white flat I got from mouser. The output peaked at 8.25A. In an EE X6 head I measured 109kcd at 6A. This beam intensity was a bit disappointing. The focus was good, so I can’t explain why it’s low.